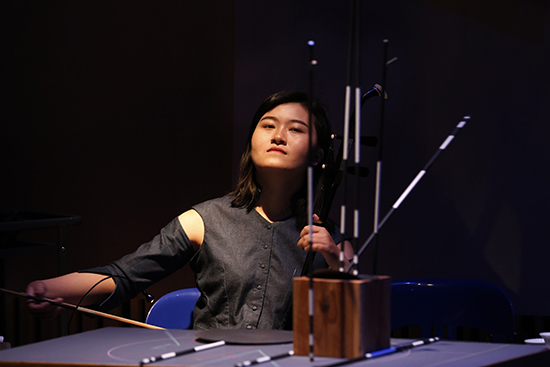 Adrian Tien’s Semantics of Chinese Music (2015) is a cultural-linguistic study of concepts related to the presence, absence, articulation, interpretation and perception of music. The book also considers Master Xu’s 24 virtues of guqin music, which include likely contenders such as “harmonious” and “pure,” but also more abstract aesthetic virtues like “luminous, lustrous,” “warm, moist, moderate, smooth, sleek,” “ancient, archaic, nostalgic,” “placid, plain, simple, quiet, unsophisticated” and “distant, far and profound.” These are concepts that listeners, performers and music critics alike could take note of. 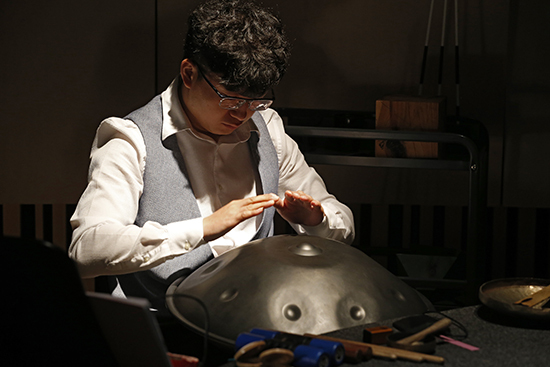 With these as the starting point for an intensive collaborative process with musicians from the Sichuan Conservatory of Music, Chamber Made Opera creates a dynamic space of translation and creation. Q? resonated with me as a music critic, one whose job it is to articulate “how someone can feel when it is like this.” The definition even follows the critical template of offering a description of a phenomenon and then an observation about it. I was prompted to contemplate the lazy susan in front of me with its arcane lines, circles and arrows as our performer, the virtuosic vocalist Carolyn Connors, assembled sculptures with magnetic sticks and blocks drawn from a trolley. With a green silk cloth and five sticks she created a miniature forest, then a house by a lake with a rising moon. 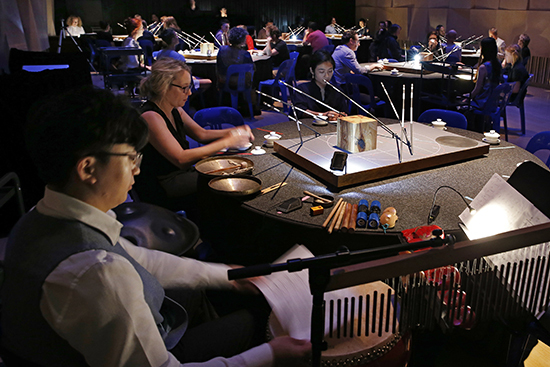 Each table is presided over by a different performer and the sculptures are accompanied by fleeting musical vignettes on sheng (Wang Zheng-Ting), erhu (Guo Si-Cen), percussion (Wang Shuai), keyboards (Madeleine Flynn), brass (Tim Humphrey) and vocals (Kang Yan-Long, Zhu Hui-Qian and Carolyn Connors). The students and alumni from the Sichuan Conservatory of Music deserve special mention for their masterful performances. 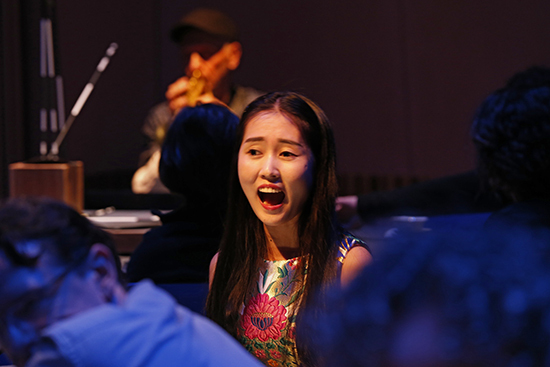 Yan-Long and Hui-Qian stunned audiences by singing to each other across the tables in full voice. These more traditional vignettes were smoothly incorporated into the more familiar Chamber Made Opera fare of extended vocal techniques and electroacoustic experimentation, such as when Connors improvised with the other performers while precisely imitating the instruments’ timbre and articulation. The creative process for Between 8 and 9 was intensely collaborative, led by Madeleine Flynn and Tim Humphrey with Anna Tregloan (installation and costume design), Jim Atkins (sound facilitation), Bosco Shaw (lighting), Felix Ching Ching Ho (dramaturg) and Tim Stitz (creative producer) deserving special mention for the production’s use of space as a reflection on the themes of harmony and community. While the trolleys, tables and lazy susans resemble the public space of a teahouse, each table is a node within a broader community of music-making and music-listening. One can turn inward, focusing on the performer opposite and the intent stares of one’s neighbours, or turn outward, taking in the diverse sounds filling the room. Concealed speakers in each lazy susan thickened the sonic atmosphere with fragmented echoes of performances from other tables, drawing lines of attention across the space much like the circles, lines and arrows decorating the table tops. The audience are not bystanders, either. For me the most powerful moment in the performance occurs when a guest at each table is encouraged to spin the lazy susan, each push eliciting a word or note from the performer. The combined rhythm of each table’s irregular pulse creates a musical mobile suspended and spinning in the room. It is difficult to create an environment for cross-cultural collaboration where all parties feel comfortable contributing ideas, but Chamber Made Opera and the Sichuan Conservatory of Music have triumphed in building this interactive stage for the communal contemplation of forms. See all production credits here.